We examined whether spatial representations for scenes experienced on the screens of mobile devices are orientation dependent and whether the type of movement (physical vs. simulated) during learning affects the encoding and the retrieval of spatial information. Participants studied a spatial layout depicted on a tablet and then carried out perspective-taking trials in which they localized objects from imagined perspectives. Depending on condition, participants either rotated the tablet along with their body or remained stationary and swiped with their finger on the screen to change their viewpoint within the scene. 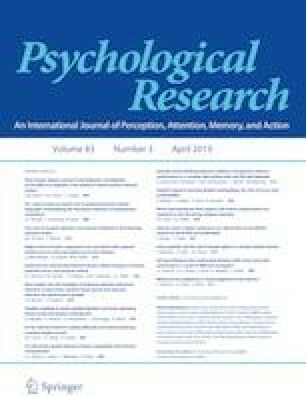 Results showed that participants were faster and more accurate to point to objects from an imagined perspective that was aligned than misaligned to their initial physical orientation during learning, suggesting that they had formed an orientation-dependent representation. Although no differences were found between movement conditions during pointing, participants were faster to encode spatial information with physical than simulated movement. The research presented here was part of S.A’s MA thesis. We thank Maria Photiou for help with data collection. All procedures performed in the reported study involving human participants were in accordance with the ethical standards of the Cyprus National Biothetics Committee and with the 1964 Helsinki declaration and its later amendments or comparable ethical standards.